A rare Jackson Pollock drip painting, fresh from a New York collection that has held it since 1983, will be offered by Sotheby’s on 16 May, the auction house announced today in Hong Kong. According to Lisa Dennison, chairman of Sotheby’s North and South America, the work, estimated at $30m to $40m, could “reach or exceed” the artist’s standing record of $58.4m, set by the drip painting Number 19 (1948) at Christie’s in May 2013. 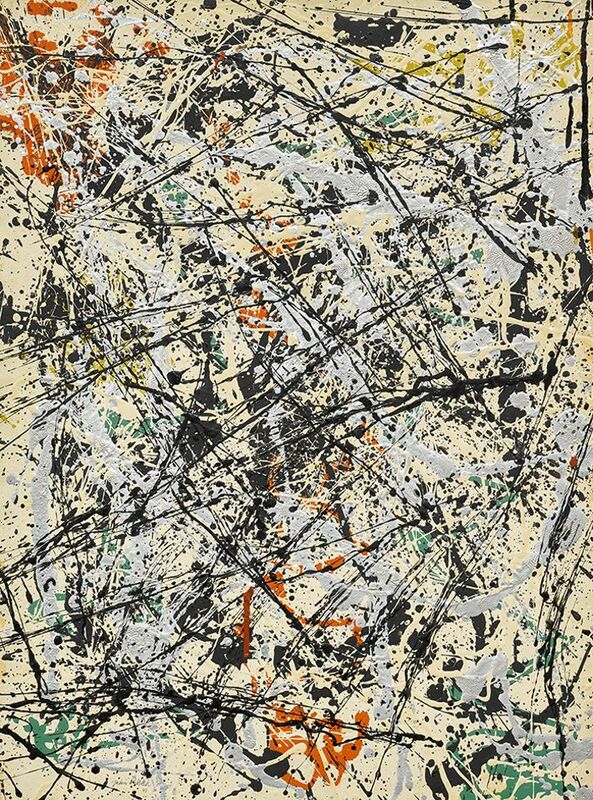 Number 32, 1949 (1949) features the American Abstract Expressionist’s signature spatters but is a relative rarity, part of a subgroup of just 16 drip works on paper affixed to canvas or Masonite. Of the Masonite versions, only half also feature shimmering aluminium paint. Comparable pieces are held by the Solomon R. Guggenheim Museum and the Munson-Williams Proctor Art Institute in Utica, New York. Number 32 was exhibited in Pollock’s breakthrough show at Betty Parsons Gallery in November 1949 and is in “remarkable” condition, says Dennison, because it rarely travelled after the owners acquired it from the Robert Elkon Gallery. The fact that the consignors, a New York couple, have decided to part with the work now, sans guarantee, is a vote of confidence in the market, Dennison says. Earlier this month, however, Pollock’s Number 21 (1950), a 22.2-inch square drip painting in enamel and aluminium paint on Masonite, fetched a slightly under-estimate £9.3m ($13m) at Christie’s London; Dennison says this one “had a very different surface quality”. The auction house’s decision to launch its tour of the work in Asia, at the Hong Kong Convention and Exhibition Centre (followed by Los Angeles, London and New York), was an obvious choice, Dennison says. “There’s an aesthetic in Pollock’s work that appeals to the Asian eye—think about calligraphy”, she says. “Art Basel in Hong Kong also attracts an increasingly international audience. We felt that this painting would speak to that group of collectors.” But, she adds, “we felt it was proper to sell it in New York”.